Shortly after joining Redbooth as an employee, I began playing with the collaboration platform’s application user interface. As a writer who also writes code, I was curious to see whether I could come up with something useful. The Redbooth API makes use of the OAuth2 authentication method, which provides a standard way for a user of one application to give permission for another application to access protected resources. For example, once the test is past, an external application that has received the user’s blessing can retrieve access files stored in a Redbooth workspace or add tasks to a task list. The application retrieves a cryptographic authentication token from Redbooth, which it then uses as proof of its right to access these resources. One of the first ideas I had was to display some sort of interactive user directory. I can imagine a few different scenarios where it might be handy to store some supplemental information about employee performance or vacation schedules in your own app, using the data structure you define rather than one provided within Redbooth. This version shown below (which you can access live here) pulls the names and profile photos for all the other users in your organization and allows you to add notes to each of these mini-profiles. Note that you’re welcome to use this application for real, as long as you’re willing to do so at your own risk; it’s not running on Redbooth’s secure infrastructure, and the data you add goes into a MySQL database on my server. If you have a serious application for something like this, you could use the code shown below as a starting point (if you’re working in PHP) or as inspiration for an app you might implement in the language of your choice, on your own server. Once a redbooth user authorizes account access, this app displays a basic user directory with the option of adding notes to each user record. The main workhorse functions are in auth.php. In the previous step, we queried redbooth.com for a code to be used to kick off the authentication process. The code is returned as a GET query parameter appended to the redirect uri specified in initialize.php. 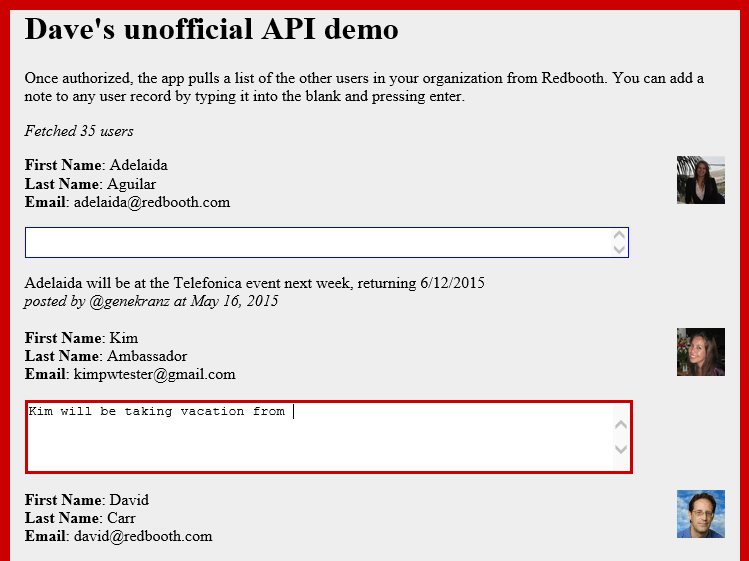 The API key and API secret are used to verify that the user has given permission for access to his or her redbooth.com account. The remainder of the code in this script is devoted to sorting the user records by last name, formatting them for display, and setting up a JQuery/AJAX routine to post notes about each user to a local database. Any existing notes are retrieved as part of a database routine that runs right before we start iterating through the user records retrieved from redbooth.com. The db.php file is a standard database initialization using the PDO class. The database access a simple table with this structure.